First, it sounds cool… And, second, in highly competitive, tight racing (and/or trying to smoke your riding buddies on the local trails) gaining big chunks of time over opponents in any given section usually doesn’t happen. It’s more like a wheel here. A bike length there… Little by little, that adds up. YES!!!! I love that. That’s a quote from the EWS World Champion and that is EXACTLY what I teach with MTB instruction and exactly what I try to apply in my own riding. Riding SMOOTHLY and efficiently is where you start stacking up those wheel-lengths (paper cuts) of time over opponents (and/or riding buddies). But how do you ride “Smooth”? Well, there are lot of factors that go into this, such as proper body position, proper technique in manipulating the bike, proper weight placement, etc., but one of the most important factors, without a doubt, is Trail-Vision and the ability to read the trail correctly. Smooth (and proper trail vision) also leads to Efficient: smooth means not wasting energy, not making mistakes, not fatiguing. And, again, all this adds up… If you participate and/or follow the racing disciplines of Enduro and Downhill, then you’re already aware of how important fractions of seconds can be. But even if you don’t, and you’re a XC racer, endurance racer, recreational rider, or beginner, the stuff we’ll address in this article is still relevant in helping you get to the next level with your riding. If you can go faster on the descents and still use less energy and recover adequately (which you can if you’re doing things correctly) then you’re going to be WAY ahead of your buddy who wasted energy, made mistakes, fatigued, and still was still slow on the descent. Let’s look some overall times from a few races last year. In the 2014 Downhill World Championships held in Hafjell, Norway, 3.028 seconds separated first through fifth places. Second place, Josh Bryceland was off of the Champ, Gee Atherton, by 0.407 seconds; and third place, Troy Brosnan was 0.566 off of Atherton. That’s half a second between first and third on a course where there were plenty of opportunities for things to go very right or very wrong. Neko Mulally was back 2.21 seconds, in forth, AND he snapped his chain right out of the start gate (we’ll address this run a bunch). Also, In the Enduro World Series in 2014, after well over an hour of timed stages and multiple days on the bikes in each of these respective races (again, with ample time for all kinds of drama to unfold), Valloire and La Thuile, 3.5 and 3.15 seconds separated first and second place, respectively. Yet, if you follow some of these races and the athletes, read and listen to interviews, etc., you’ll notice how none of these top riders are saying, things like, “I just need to go faster” or “I just have to pedal more”. Nope… There is a ton of strategy to this game. It’s not simply about “trying harder”. Being smooth…Going slow to go fast…Braking for speed… And especially SEEING THE TRAIL PROPERLY all come into play, big-time, when trying to ride well. This is true at the highest levels as well as the recreational and beginner levels of riding. If you consistently take bad lines on the trail (often the main line, because it’s created with the bad riding techniques and bad trail vision of the majority of riders) because you don’t understand trail-vision and don’t know how to read the trail properly…well, you’re only going to be able to go so fast (and you’ll be out of control and unsafe). Most riders, when they try to go fast, do things backwards: the ‘aggressive’ part comes first, and that just gets them into trouble because they don’t have fundamental skills and strategies to build off of and use as tools. Using the wrong tools for the job—even using them well—will only get you so far. Putting the bike in the right place on the trail is huge when it comes to riding smoothly. Vision is a massive component of this, and arguably the most important part of riding. It comes first in every situation. If you can’t read the trail properly, then it doesn’t really matter how good you are at any other aspect of riding; you’ll consistently be going to the wrong places on the trail, your momentum will consistently be getting you into trouble, and you’ll be fighting the bike, the trail, your body mass, etc. ; crashing at worst, and wasting time and energy, at best. Easy example: you’re cruising down the trail and there’s a right turn up ahead. Well, hit that right turn as fast as possible with good technique right? Except that “right turn” doesn’t mean much. You need to look past that turn to a point where the turn is over, your “end point”. You need to get to there in the least amount of time possible and with maximum speed/momentum lined up correctly for your next end point, which will soon come into sight…if you’re looking for it! Even if you’ve ridden the trail a million times, you still need to “spot you mark” at your end point. This is human movement 101 stuff: you WILL go where you look (we get way into this in the clinics). Often, this may mean looking through trees, catching just a patch of trail, but that’s all you need at this point in time, you’ll deal with the details of the trail later (we do have to look at and process the details of the trail, eventually). This tells you all about your momentum requirements for the turn. Is the turn 90 degrees? Does it come back more then 90? Is it less then 90? Different answers to that question (the angle, or sharpness, of the turn) will require or enable you to treat you’re momentum differently. If you don’t see the end point, then you don’t know how much you need to slow down (or not) before you enter the corner. I used a corner for this example, but any section (or successive sections) of trail need to treated this way. This is a huge component of “Smooth”. 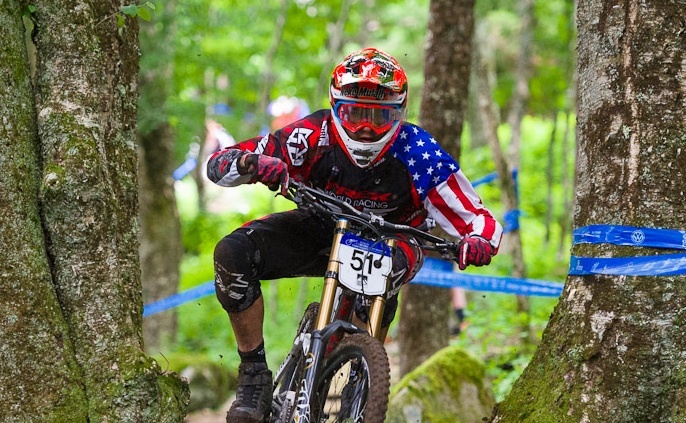 Neko Mulally, when interviewed in Dirt Magazine, November ’14, about his 4th place in the 2014 DH World Championships and asked how he pulled off a podium without a chain (his best result to date), had this to say, “I don’t know how I was able to think about all of this on the spot, but watching the replay, I braked harder in some sections in order to carry a straighter line or more exit speed and also made smoother arcs through the turns…that’s something I need to tap into more often”. Yep. That’s also Proper Vision at work… Anybody that has been around Downhilling for a while has probably raced chainless DH races. The chainless race times are always pretty close to the times when the chains are on (commentator, Rob Warner, mentions this during Mulally’s run). This always blows people away, but really it shouldn’t be a huge surprise, because when you can’t pedal, you end up milking every little bit of speed out of the track (pumping, etc.). You minimize every impact…and, you look way down the trail for those smooth momentum paths, straight lines, and smooth arcs. There’s a saying in motocross racing—and it applies to MTB whenever the trail gets a bit tough—that “the top riders are looking at a totally different track then everybody else”. It’s the same track, it’s just that the top riders are looking for those ‘smooth momentum paths, straight lines, and smooth arcs’ rather then just riding the main line on the trail as fast as they can. This is also why the top riders are the first to adjust and find new lines on the trail or track—create new lines—when the old ones start getting blown out. Smooth momentum paths have to be seen first; that’s where you should start. Then, you try to apply a line on the trail’s surface to that momentum path, not the other way around. This is relevant to all riders. Proper technique—especially proper vision—will save you energy. Big-time!!! On normal trails, not DH or descending oriented trails, we’re going to have to pedal a ton, but if we do things right, we can save that energy for when it really counts. Watching Mulally’s run, there are flat sections of track where he is coasting paaaainfully slow. He names numerous sections of track (probably about fifteen seconds worth) where he would have been sprinting had he had a chain. He was two seconds out of first place. Let’s face it, if Neko Mulally would have used those same techniques: seeing the track better, going slow to go fast, being smooth and efficient instead of overly aggressive…and had a chain, he’d be the World Champion right now. Being smooth on the bike is a crucial part of riding well at any level of riding. SEEING THE TRAIL PROPERLY is a huge part of this. Macro-Vision is but one component of proper trail vision. Many of the techniques I addressed above are completely foreign to most beginner, novice, and/or intermediate riders. Those riders NEEEEEED to learn these techniques if they want to get fast and/or be safe on the bike. And, what I find pretty cool and half-fascinating is that even for Neko Mulally, one of the best riders in the world, who is clearly doing a lot of things, technique-wise, pretty well (you can’t ride that fast unless you’re doing a lot of things correctly)…there’s still a lot to learn. Good stuff, I needed to read that. I never read or heard any of Neko’s insight to that run either. I’ll look for your van at Keystone this year if you find the time to get out there. Hey, Andy! Good to hear from you. I plan on getting up there a bunch this summer. I’ll see you there! Your Trail Vision article’s a great motivator. In the Neko downhill video sans chain, the announcers go from repeatedly talking about what a bad break is was to being amazed how fast he completed that run, Priceless! I understand your Coaching our BetterRide weekend in GA later this month and I look forward to seeing you soon.